We’re often told nowadays that because people are busier than ever, have very short attention spans, and get distracted by lots of adverts, you must focus on creating short form content. If you want to grab their attention via content marketing, the general wisdom goes that you must get your message across in a minute or less, or you risk the chance of losing your audience to your competitors. Well, I have to respectfully disagree on this theory. 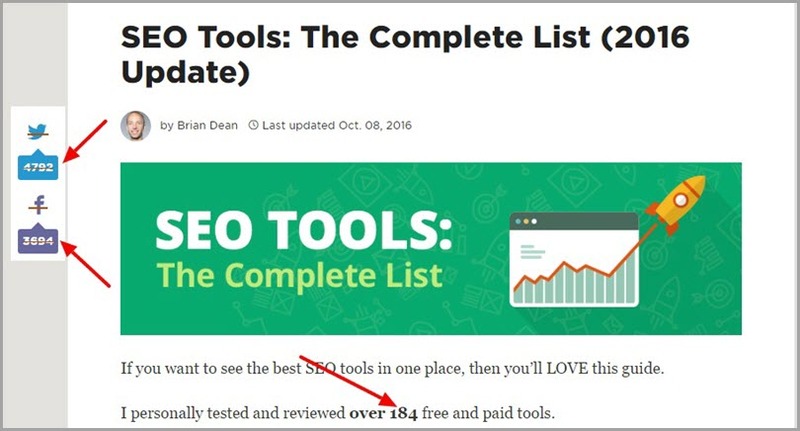 In this post, I will provide you with lots of evidence that long form content will not only be read by your audience but will also convert them more often. To add to its advantages, long form content can also help you look like an expert in your niche, increase the likelihood of your content being shared, enhance your search engine rankings, and generally boost brand awareness. There’s a brilliant case study by Highrise Marketing that reveals the efficiency of long form content in driving conversions. This company wanted to increase their website signups so they delegated the conversion process to a couple of experts who engaged in some A/B split testing. 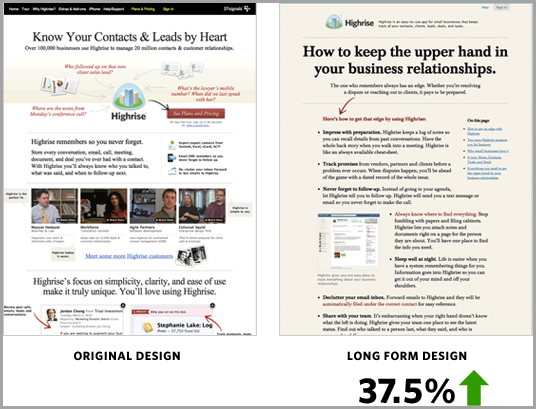 They determined that the homepage with longer-form content saw an increase in conversion rate of over 37%. The media want us to believe that people no longer have the capacity to concentrate. Realistically, a page can never be too long instead – it’ll be too boring. In the case of Crazy Egg’s homepage, our visitors wanted answers to their many questions, and that’s exactly what we delivered. So if you initially made it a habit to publish half-baked, incomplete, short-form content on your website’s blog, you’ve got to stop now. I admit that this type of content is often quick and easy to write, but if you’re looking at the long-term benefits of producing content, you have to rework your strategy now. All my experience says that for many great products, long copy sells more than short – advertisements with long copy give people the impression that you have something significant to say, whether they read the copy or not. The good thing is that with adequate research, anyone can create great long form content. I will educate you on what long form content is. I will provide you with reasons why you should be focusing on long form content. I will teach you how to write it effectively and use it to dramatically boost your search rankings. The strategies you will learn are easy and actionable. Let’s get started. What is long form content? The term ‘long form content’ has a different meaning to different people. However, the general consensus is that long form content is content that is in-depth, comprehensive and detailed. Personally, I don’t consider any content that is 1,200 words or below to be long-form content. If you’re truly trying to publish longer-form content, then go for anything upwards of 1,500 words. In my view, any article that’s above 1,200 words is a long form article. Many of the marketing gurus on the internet today post 5,000+ word articles on a regular basis. Why write long form content? Arguably, shorter form content no longer creates a big impact either in your reader’s eyes or in the eyes of search engines. The short form content strategy may have worked once, but it doesn’t anymore, unless you’re Seth Godin or an authoritative figure. 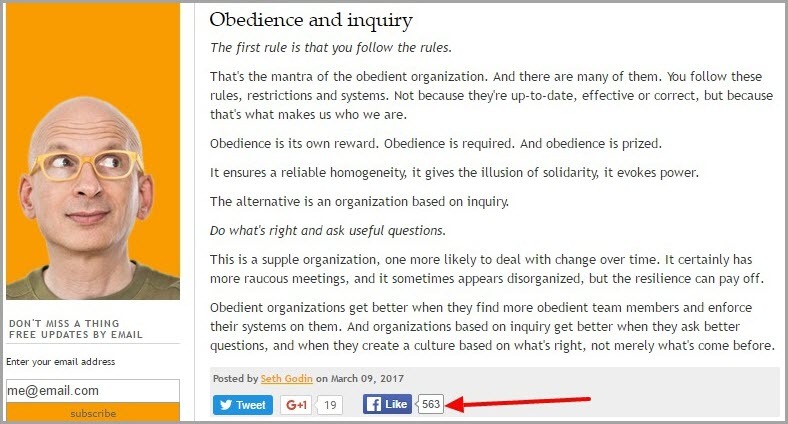 If you visit Seth’s blog, one thing you will notice straightaway is that 99% of his blog posts are short (less than 200 words) yet they still get lots of exposure, judging by the amount of shares and engagement. You might be wondering why. Well, the answer to that should already be obvious – Seth is an authority figure with lots of loyal followers so everything he does is considered epic. However, in general, internet users are becoming smarter every day; they’re looking for specific answers to specific questions, hence the increasing number of long-tail searches. For you to remain in the game, your content strategy needs to improve dramatically to match their needs. As a writer, you need to laboriously craft more words which will not only benefit your readers but will also enhance your SEO and conversion rate. Below are some more reasons why you should focus more on producing long form content. 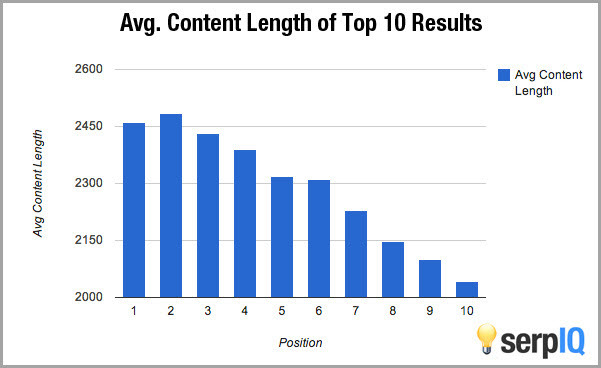 Long form content has proven to generate more leads than shorter articles. 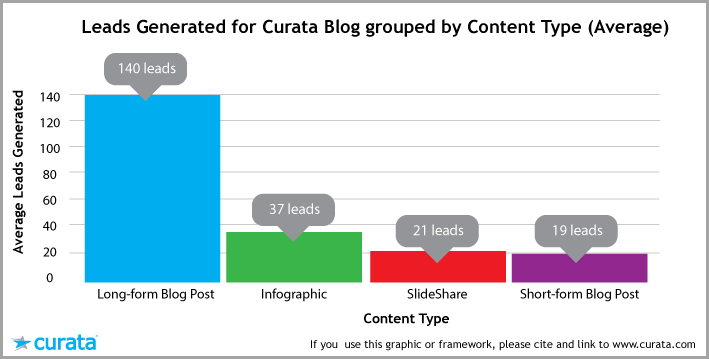 The team at Curata adjusted their content marketing strategy to create longer and more in-depth content after analyzing the existing content on their blog, and discovered that the longer posts far outperformed the shorter ones. Via their analysis, they discovered that long form content on average generates seven times more leads than short form content. This is a pretty obvious point. The longer your content, the more time visitors will spend reading it. If you don’t already know, Google uses the amount of time people spend on web pages to assess their quality and trustworthiness. If your visitors often spend a reasonable amount of time on your site, you will be rewarded by Google. This is simple logic. It means that posts with more words will yield higher engagement from the people reading it and therefore you should allocate more time and resources to creating informative long form content. One of the biggest benefits of writing this type of content is because of the exposure it brings, which often results in more social shares and backlinks. Typically, writing long form content will enable you to appeal to a more broad audience, and thus, the content will eventually become a quotable source for many bloggers once the topic is on trend. Similarly, the more in-depth, diversified and evergreen the article is, the more people will willingly link to it, which also means it will have a better chance of ranking high in the SERPs. Not only did Brian’s post attract a reasonable amount of social shares, but it was also massively linked to from different sources. The screenshot below from Moz Open Site Explorer shows that it currently has a total of 820 links pointing to it. 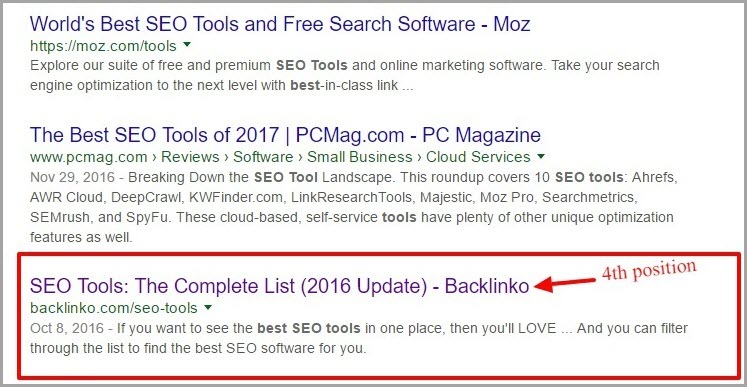 Now, if you proceed to Google and search for the keyword ‘best SEO tools’ or ‘best SEO tools of 2016’, you will see the same post right there on the first page, occupying the 4th position. This is the type of result you’ll expect to see when you publish great content that is painstakingly detailed and in-depth. I doubt you will see this type of traction by writing a 500-word article. As you can see, on average, posts with over 2,000 words are ranking much higher than shorter form posts. This is something else to ponder. I first came across this sentence from Simon Sinek, and ever since then, I’ve been using it whenever necessary because it rocks. The first thing you have to do is to define your reason for creating this type of content. Hopefully, it’s not just because a blog post on Jeff Bullas suggested you do. Your aim might be to rank high in search engines so you can generate more leads; to connect more deeply with your readers; to be seen as an authority in your niche; to create strong brand awareness, etc. Your reason does not matter, what’s important is for you to know your ‘why’. This will eventually determine your execution plan, and help you know if the campaign is a success or failure at the end. 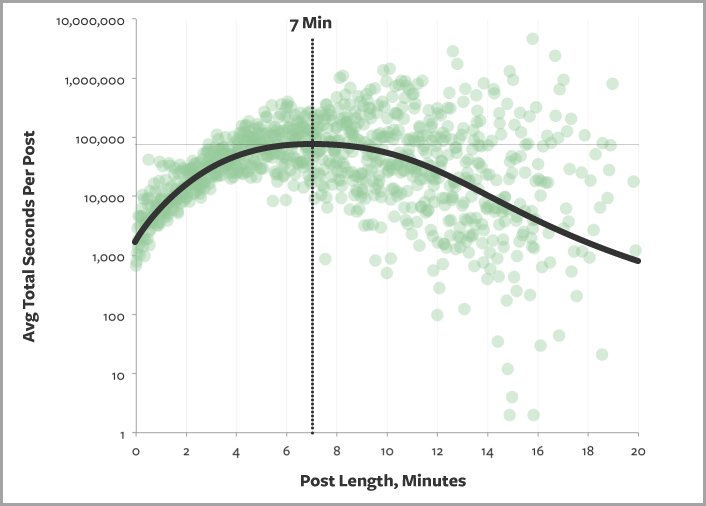 Why you’re writing long-form content. Who the content is intended for. What being successful will look like, and how you’ll measure it. Once you’ve decided why you’re writing the content, figuring out the topic shouldn’t be too tricky. Here, you want to choose a topic that will appeal to your audience and encourage a certain action or activity from them. If you’re stuck, there are heaps of resources out there that can help you brainstorm ideas. 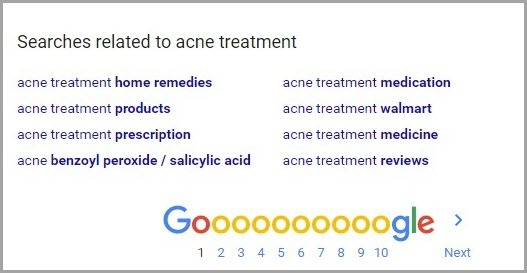 Make use of Google to see what’s already trending on the topic you want to cover and see what has been written about it before, as well as which keywords to target and the best angle to come from. Here’s the most exciting and obvious part. According to Neil Patel, adequate research is critical to writing high-quality content, so carry out whatever research is required on the topic you’re covering. It doesn’t actually matter whether you’re an expert on the topic or not, performing proper research is still necessary. Once you’ve gathered all the resources you need to write the content, you can start writing. Remember to use enough data and statistics to back up your claims. You can also include different types of content in the post so that you can appeal to a wider audience. I’m talking about including videos, infographics, podcasts, etc. All these will enable you to create the best content ever written on that topic and Google will have no choice other than to reward you by ranking you higher than your competitors. Remember the aim of writing this article is to get it ranked in Google. For you to achieve this, you need to observe the search engine ranking factors, especially that of Google. According to Backlinko, Google uses approximately 200 ranking factors when determining how to rank pages. Therefore, for your long content to perform well in search, you need to pay attention to some of these metrics. Externally link to relevant sources. Internally link to other written content or product pages. Disperse your keywords strategically throughout the article. Properly optimize your images for your chosen target keywords. Mention your keywords in your h2, h3, and other header tags. You basically want to obey all of the on-page SEO rules. It will be a waste of resources, time, and effort to create this labour-intensive type of long form content if you just sit back and hope it gains traction. The era of ‘build it, and they’ll come’ is well and truly over. In today’s world, if you want eyeballs on your content, you have to promote like crazy. At least initially, you have to create some of the buzz before the content starts promoting itself. Spending money on ads to promote your long-form content is not a waste. This type of content when properly written and optimized will bring back every penny you spend on it. But also try reaching out to any influencers you might know, as a link from them will go a long way to boosting your ranking. If you’re still searching for a strategy to get a struggling website up and going, why not create some informative and in-depth long-form content today? This type of content has been proven to work for many people, and it will almost certainly work for you too if you follow the tactics shared above. Therefore if you’re not yet utilizing the enormous benefits of long form content, you’re losing out big time. Just remember that longer form content without a great title, keyword strategy, and appropriate distribution will not yield much success. Guest Author: Theodore Nwangene is a marketer, Freelance Writer, and a publisher. I’ve created lots of successful blogs for the past 8 years. Right now, I just created a new one called IM Views. On this blog, I will share with you all the things I’ve learned about making money from the internet for the past 8 years. It’s going to be like something you’ve never seen before. So, please stop by and say HI to me. 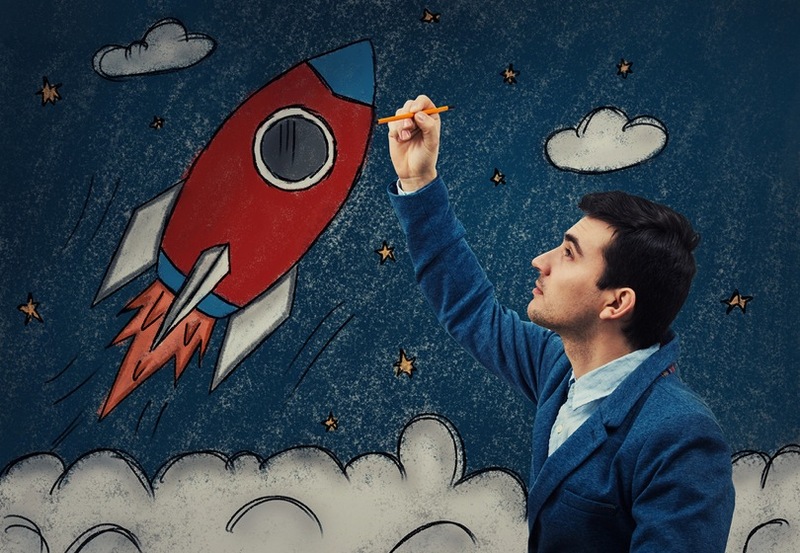 The post How To Use Long Form Content To Skyrocket Your Search Rankings appeared first on Jeffbullas’s Blog.